Multiple Exchange EDB mailboxes can be merged together using EDB to PST Converter software. User can create a single PST file for EDB mailbox including all the data. The application is built to create UNICODE PST files so that Users can convert a large-sized Exchange Database .edb files and software performance won’t be affected by the quantity. When users convert EDB to PST file format, the software permits to export .edb mailboxes into .pst file including all data items. 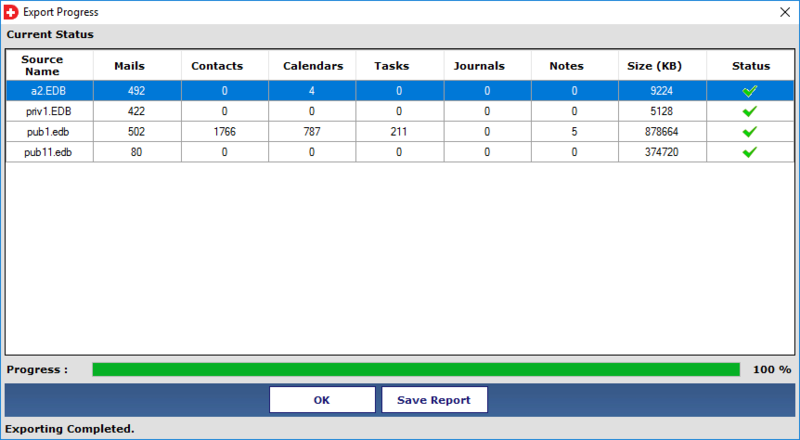 Each mailbox folder contains Inbox, contacts, calendars, tasks, journals, notes, etc would be migrated into PST. The program assures to migrate each data from Exchange server EDB to Outlook successfully. Browse the EDB mailbox in which the desired files are saved and then, further continue with the conversion process. The EDB file to PST converter tool allows to save the selected file during exporting the mailbox from Exchange server EDB file to PST file type. File selection feature, will helps to convert only the selective items of any Exchange Server mailbox. Select File(s): By using this option users can perform the conversion of selected .edb files. 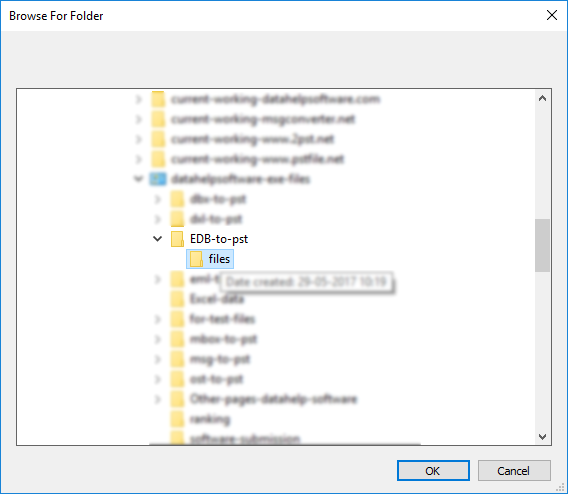 Select Folder: With the help of this option user can convert entire folder in which multiple EDB files are stored. While exporting Exchange mailbox items to PST format, Pause & Resume option plays an important significant role. The EDB Converter software allows a user to pause the exporting process at any time and may resume it later. 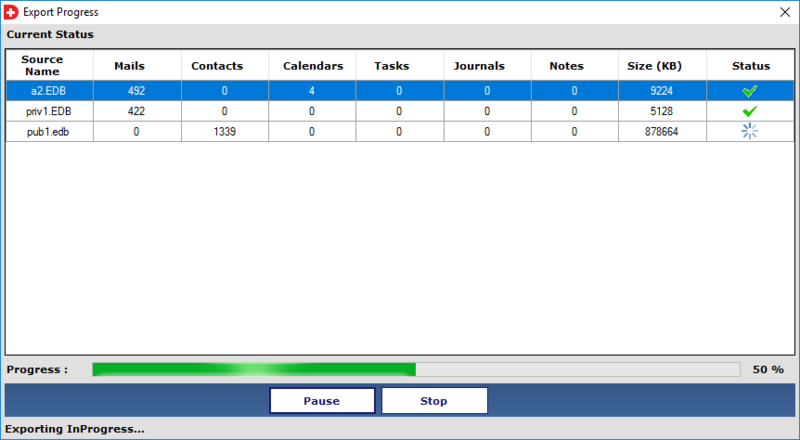 This will shown the current status of each components (emails, contacts, tasks, etc.) 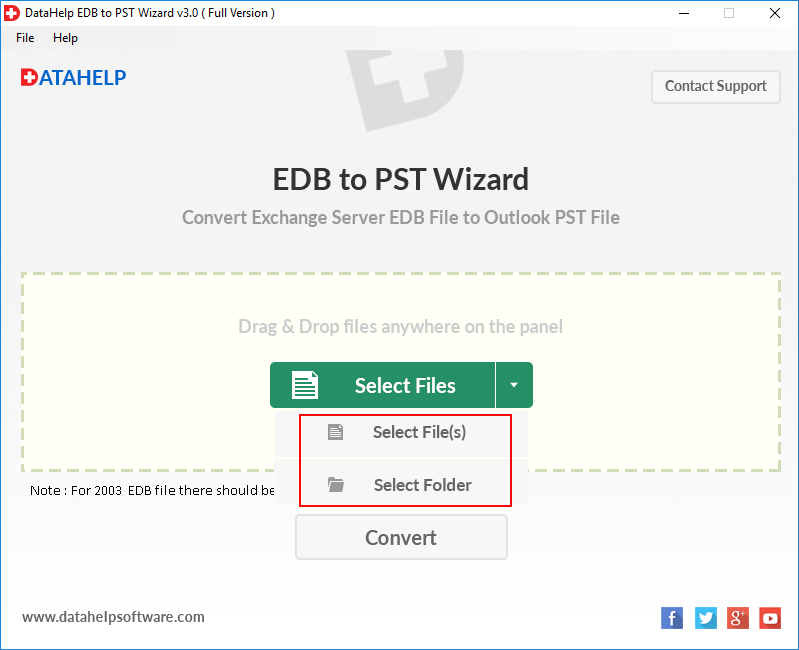 of EDB file one by one and then, exported the .edb files into PST format successfully. Exchange EDB to PST Converter software provides an advanced option to split up large output file into smaller parts and easy to manage the file size. It is an optional feature so that user can check or uncheck the option by size. With this option, the user allows to create multiple smaller files from a single large file in output. The Demo Edition of the EDB to PST Converter Wizard will export only first 10 items of Exchange database to Outlook PST. Does the software allow users to migrate only selective files? Yes, the EDB to PST converter permits a user to export only the selective .edb files into PST format also. 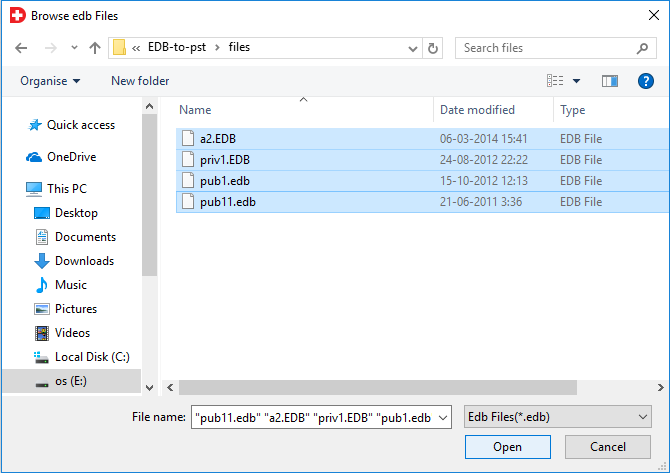 Is there any way to convert bulk of data from multiple EDB files into one PST? Yes Of course, the Exchange to Outlook converter software allows to convert .edb files to .pst format in bulk. It will take few minutes to transfer the data from Exchange mailbox to Outlook PST. Is it mandatory to install Outlook client to perform the Exchange EDB to PST migration? No, it is not necessary to install the MS Outlook on the machine to migrate Exchange to Outlook. Is there any EDB mailbox size limitation to perform the migration? No, there is no file size limitation on the software. Users can easily import an unlimited number of .edb files into Outlook PST format. Can the software retain only the User folder structure after conversion process? Yes, this software will maintain user folder structure and avoid the System Folder structure. Can I easily export password protected EDB files using this software? 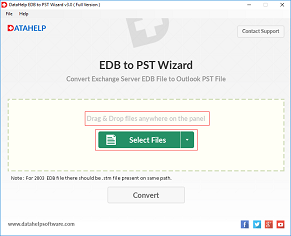 Yes, Exchange EDB to PST exporter is an advanced software and capable to convert EDB file to PST in any situation either it is password protected. 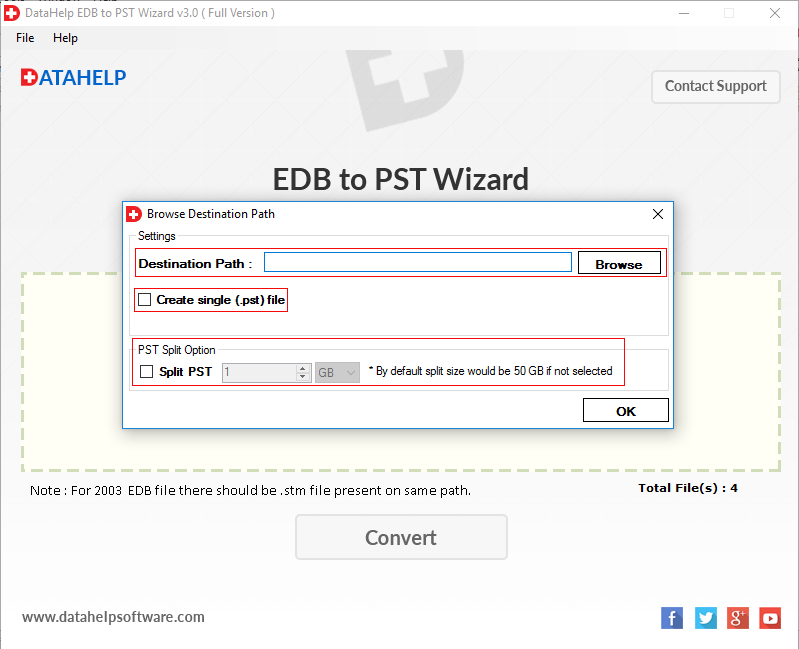 "Amongst all the softwares, I found DataHelp EDB to PST Converter tool the most suitable solution and I was probably right with the decision. This product made it so easy and simple for me to get all the exported EDB data files into a single PST file format. Also, such files saved it into Unicode formatting which enabled me to have larger storage. Thank you so much to the development teams for creating an Outstanding utility to migrate data of Exchange to Outlook." "I would like to thanks the software team for developing Exchange EDB file to PST converter software, which is very powerful and user-friendly in use. The best part I really like about this product is that it allows me to import .edb to Outlook. Moreover, batch conversion is also very nice feature for the bulk conversion."